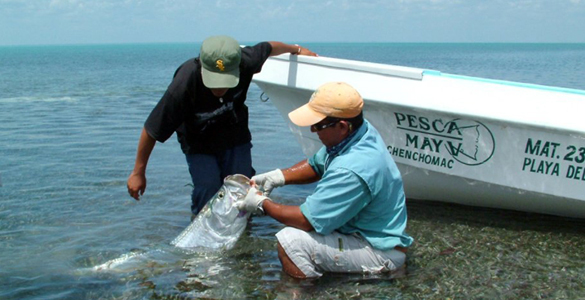 Pesca Maya started in 1996 outfitting anglers to catch bonefish, permit, tarpon and snook. 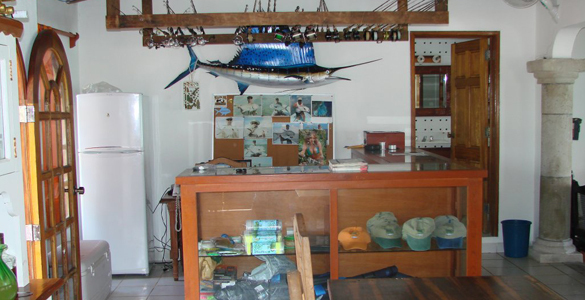 With the years, we gained our reputation among fishermen all over the world, which not only makes our anglers come back year after year, but also makes them bring their friends and families along. 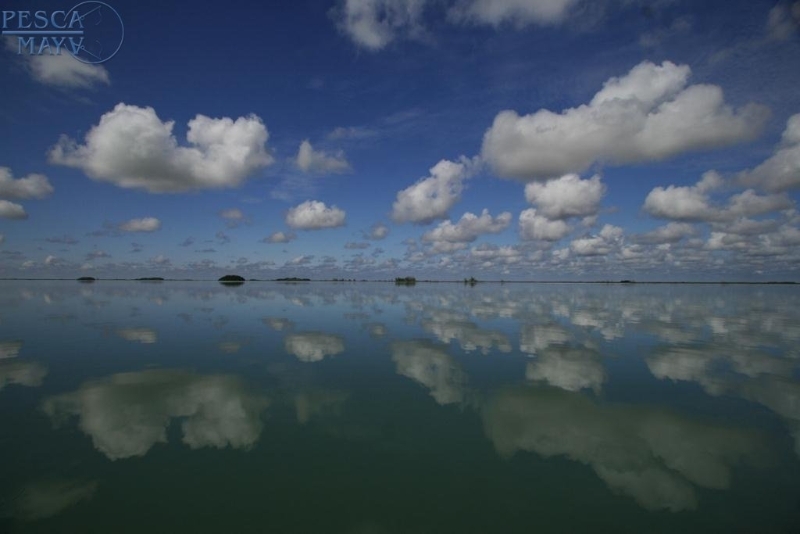 The lodge is located 90 miles south of Cancun in the 1.3 million acre Sian Ka’an (Mayan for “where the sky is born”) Biosphere Reserve. 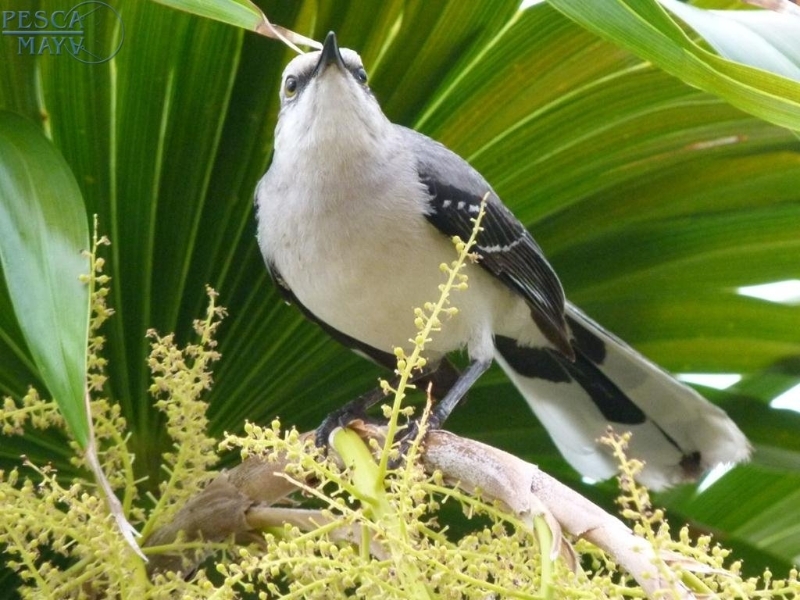 Situated on a long, narrow strip of barrier beach, the lodge is virtually surrounded by water. 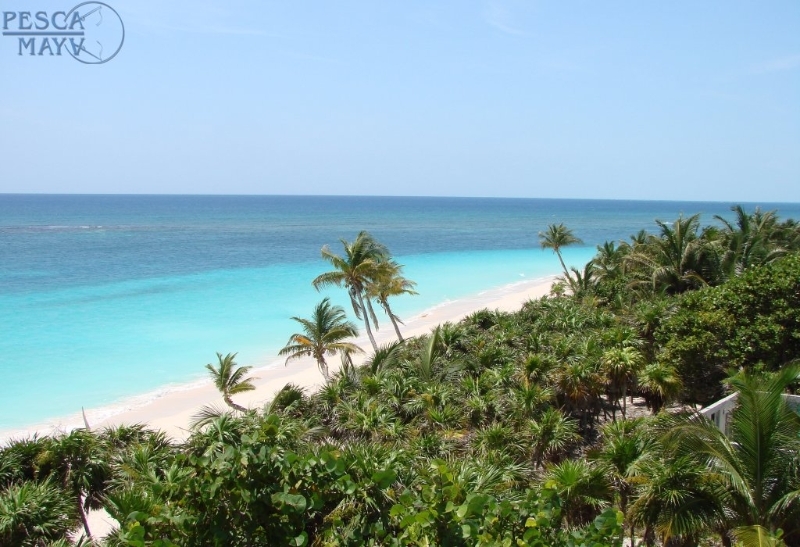 To the east lies the blue Caribbean and a few hundred yards off shore, the Palancar Barrier Reef which stretches from southern Belize to north of Cancun. 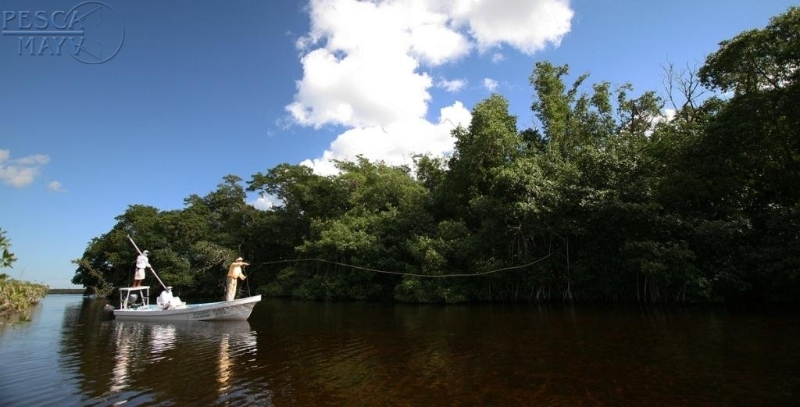 On the western side lies the vast “El Rio” system of flats, channels and mangrove. 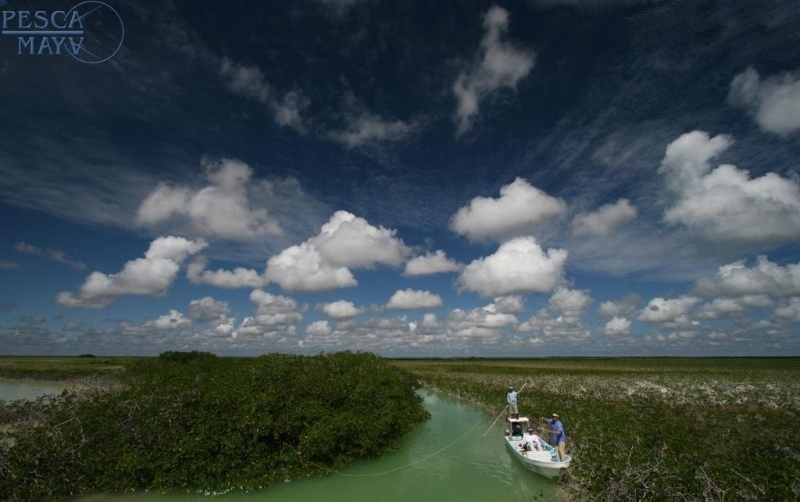 10 miles to the north is the famed inlet through the barrier beach known locally as the “Boca”. And 4 miles to the south lies the incomparable Ascension Bay. 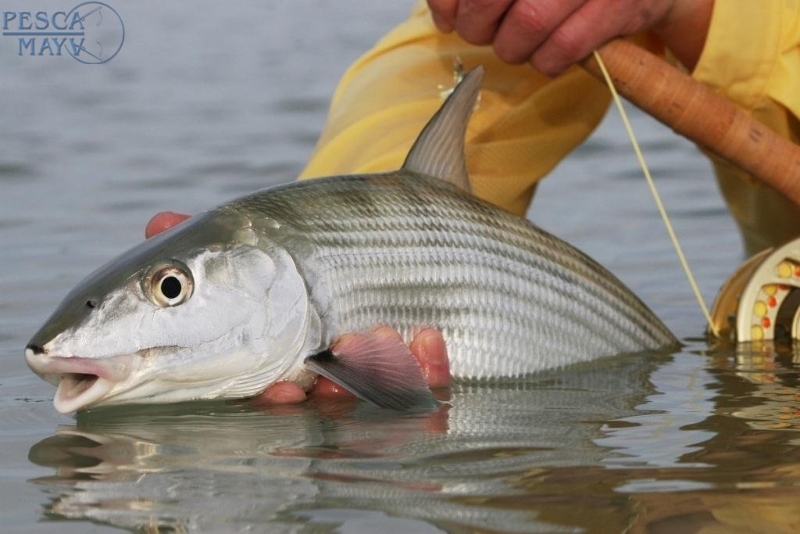 The entire area boasts some of the Caribbean’s greatest flats fishing for bonefish, permit, snook, tarpon and others, as well as reef and offshore fishing (in season). 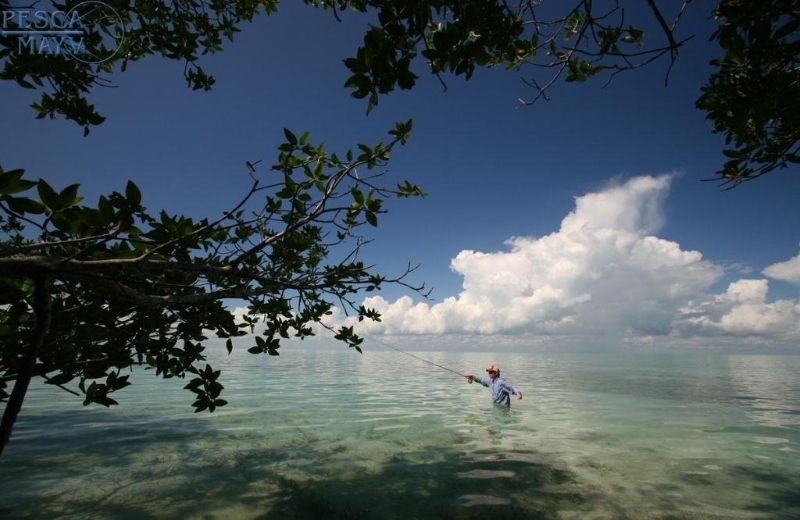 Fly fishing Ascension Bay speaks for itself and is truly fly fishing heaven. 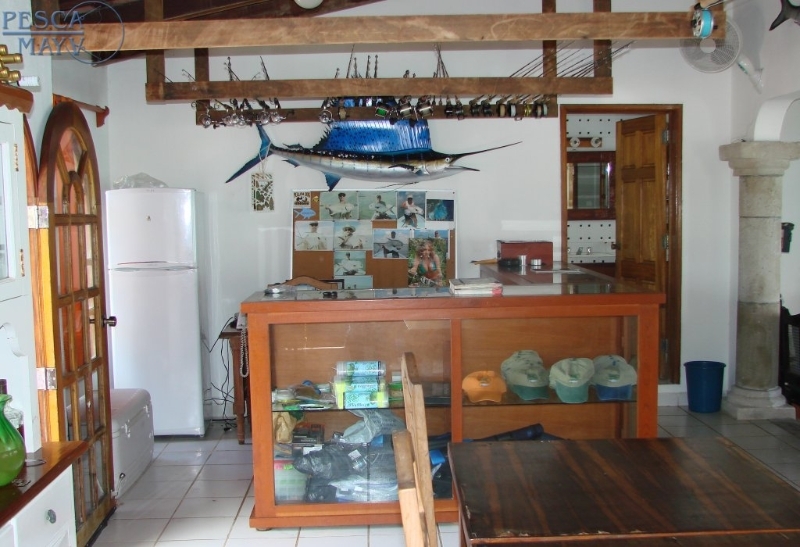 We can take up to 20 anglers in the lodge, sharing rooms; offering our own Fly-Shop, 15 boats with the best guides in the area, and a beautiful beach where you can relax while not fishing. 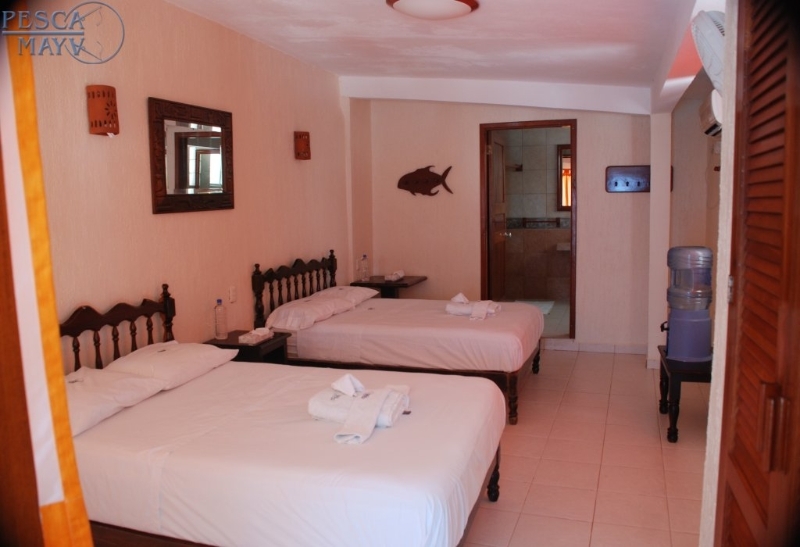 There are 10 rooms, all with A/C and private bathroom, most with oceanview. Located in a solitary white sand beach, turquoise water and a magnificent coral reef at 90 yards from the beach. We also put 2 guides in every boat for that extra pair of eyes. 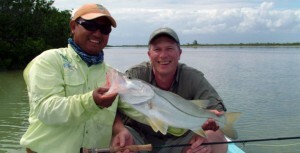 Since most of the bonefishing is wading this means both clients on the boat can fish separately with a guide. 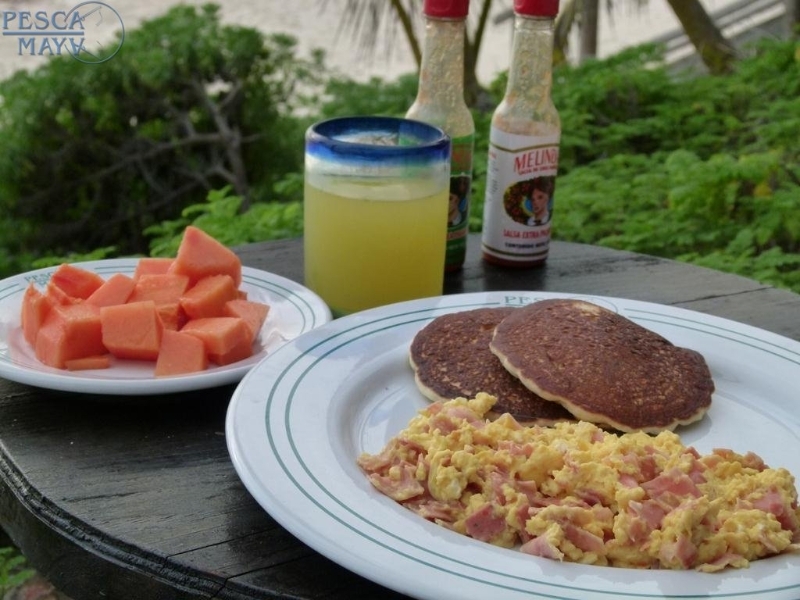 Our meals are home-style, with breakfast buffet and boxlunch for our fishermen. 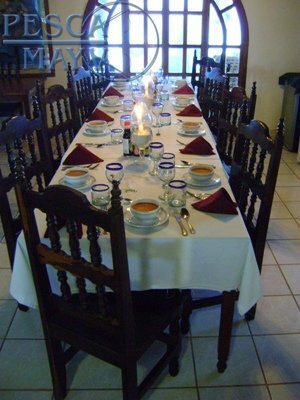 For non-fishermen, our Chef will prepare a traditional Mexican Lunch at the lodge. Daily changing dinner menu, barbecues and other specials. Breakfast. – Fruit of the season like melon, watermelon, papaya, pineapple, etc. Juices: orange, pineapple, apple, etc. Eggs at your choice or pancakes. Box Lunch. – 2 sandwiches per person plus a variety of snacks. Dinner. 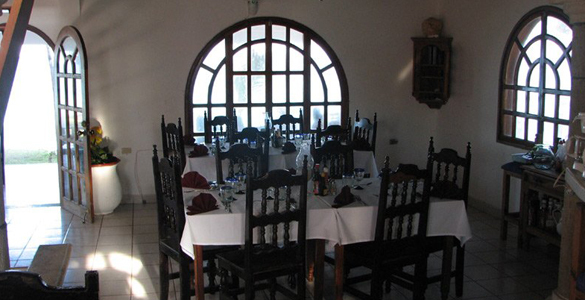 – We offer a variety of soups, salads and vegetables, for the main course there is fish, steak, shrimps, fresh lobster (seasonal) and chicken alternate throughout the week. Beverages and drinks. 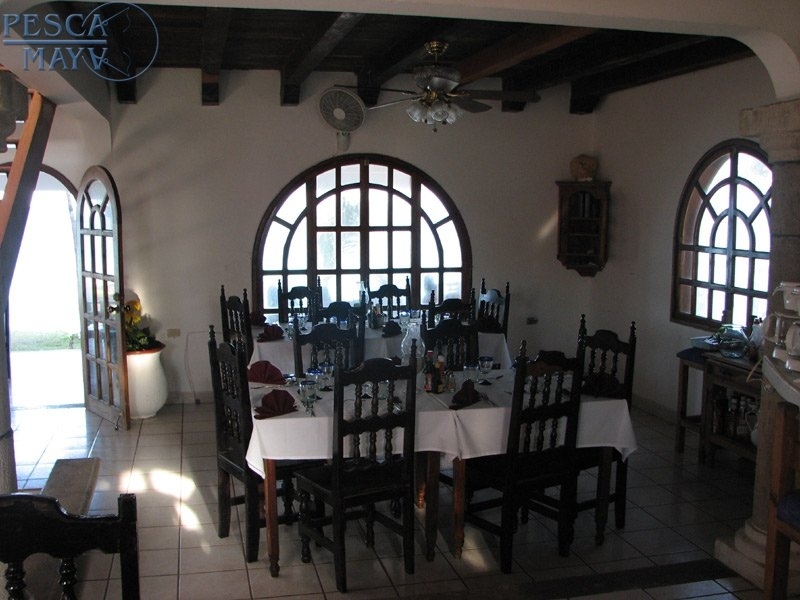 – We include purified water, sodas, beer, wine on the table and national cocktails like margaritas, screw drivers, vodka tonic, rum & coke, etc. We do not have imported liquors available, if you have one of your preference, you can bring the bottle along at no extra charge. 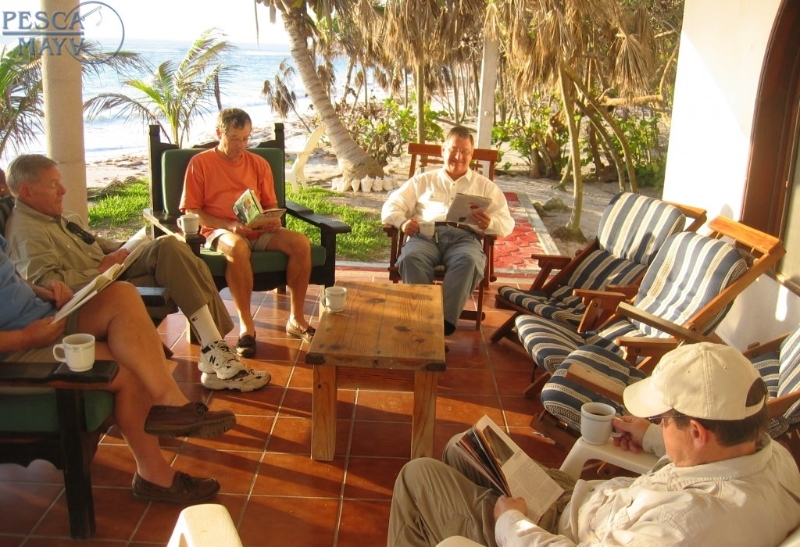 Personal attention is our special touch in making your trip a memorable experience. 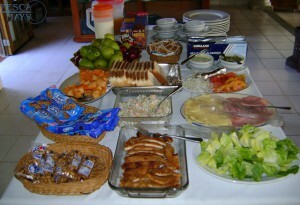 If you need to follow a special diet like low fat, low cholesterol, no sugar, no sea food, etc. please let us know – we will take care of it. 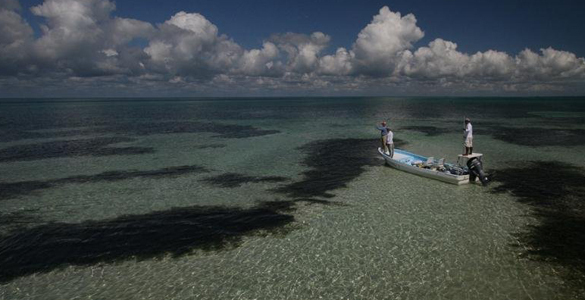 Variety is the word to describe fly fishing Ascension Bay and the Boca Paila flats. 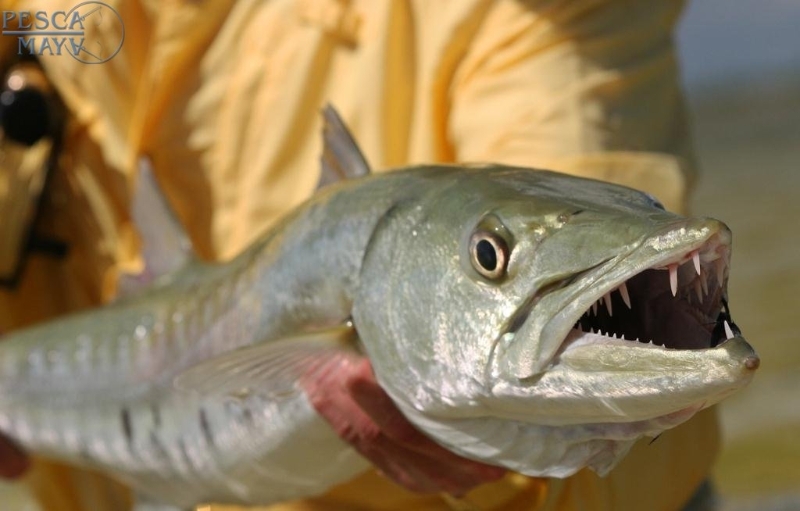 There are hundreds of square miles where it’s common to see bonefish, permit, tarpon, snook and jacks or barracuda in the same day, all year round! 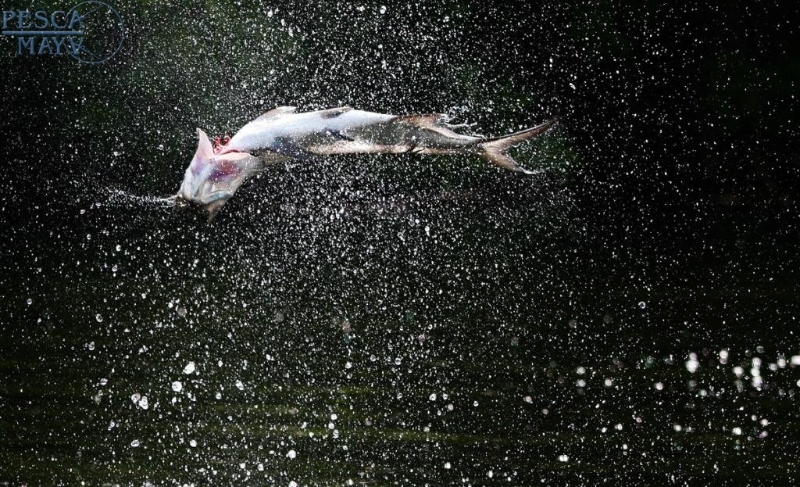 With seasons for migrant tarpon and snook. That’s why probably more Grand Slams have been caught here than anywhere else. You certainly have to bring tackle for all these species and at least 3 rods to be ready anytime. 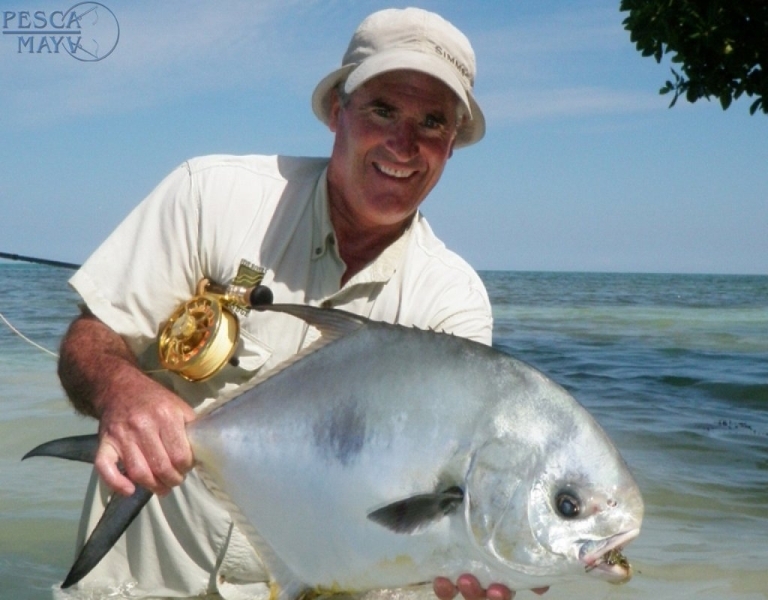 After reservation we will send you complete tackle list. 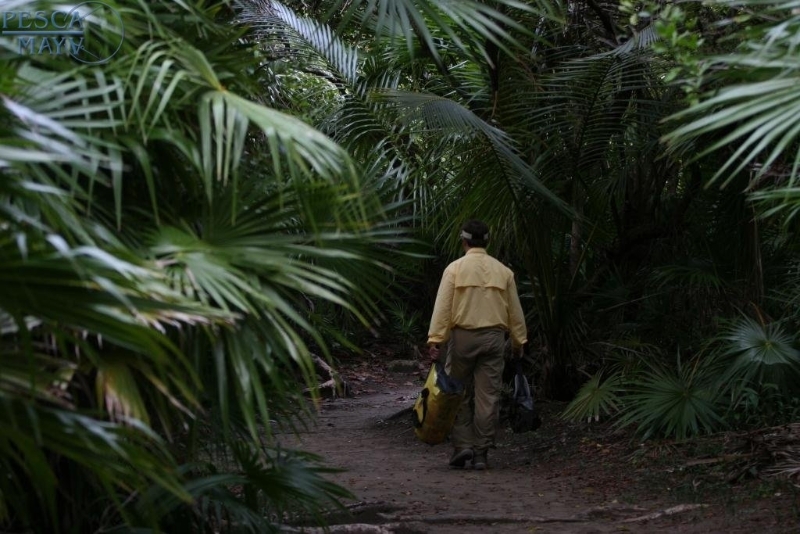 We can go south and be in Ascension Bay in 15 minutes, or if the wind blows too hard, we can go north and find flats surrounded by mangroves that help to protect. 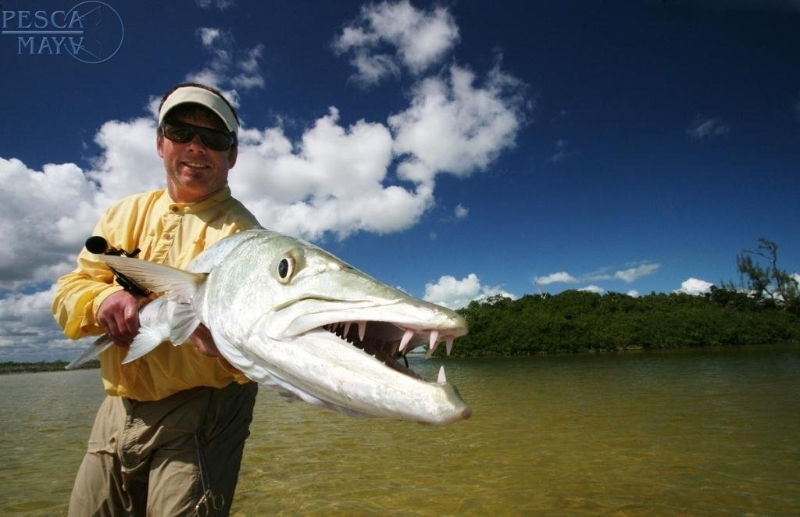 Both places are well known for its bonefish, permit, tarpon or snook and barracuda abundance. Wind protection is one of the great advantages of this area. 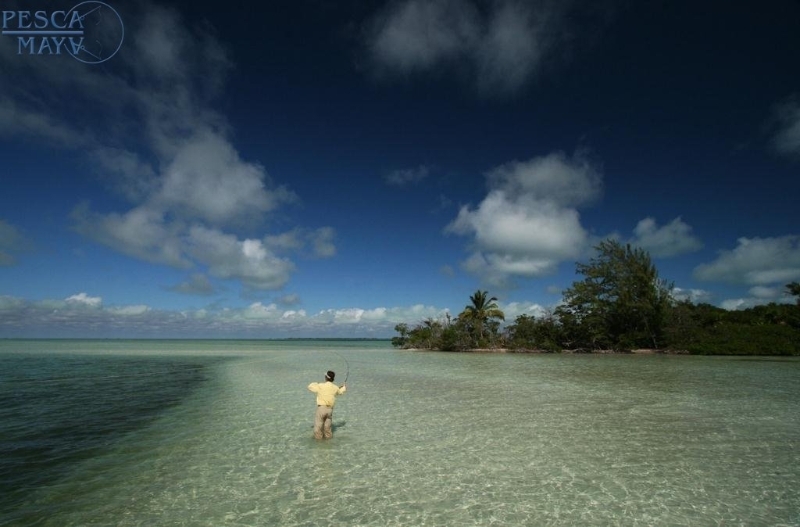 Unlike Bahamas , here we can fish for bonefish 365 days of the year. 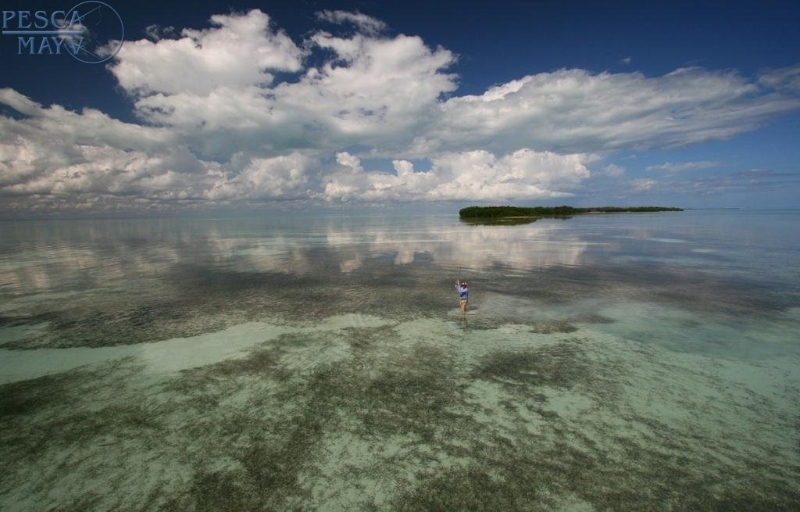 Of course in Tulum and all the Yucatan Peninsula we get very windy days, from South East, East and North, but we can always find protected flats or lagoons where we can see and cast at bonefish, permit, tarpon, snook, jacks, barracudas, and other species. 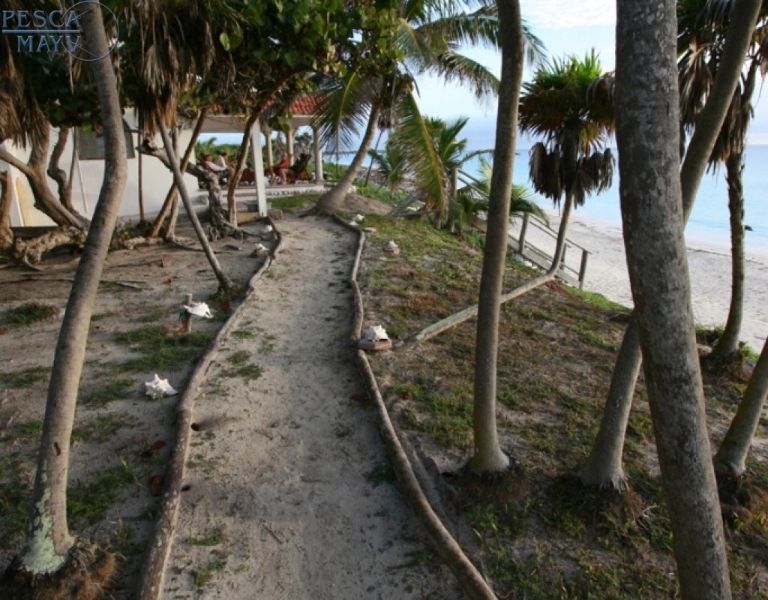 Pesca Maya started the guiding school 12 years ago. David Aimes from Montana and Vincent Grillo from Florida put together a Fly Fishing Guide Seminar, guides and apprentices participated. 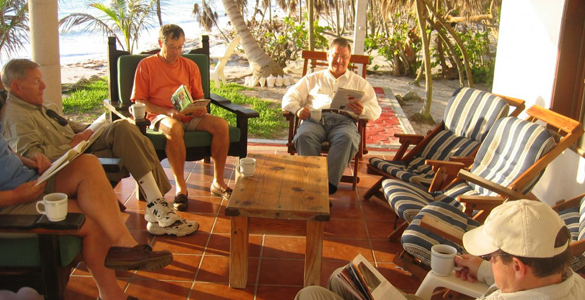 They recruited some of the old “Pez Maya Lodge” guides and the best Punta Allen guides from the village. 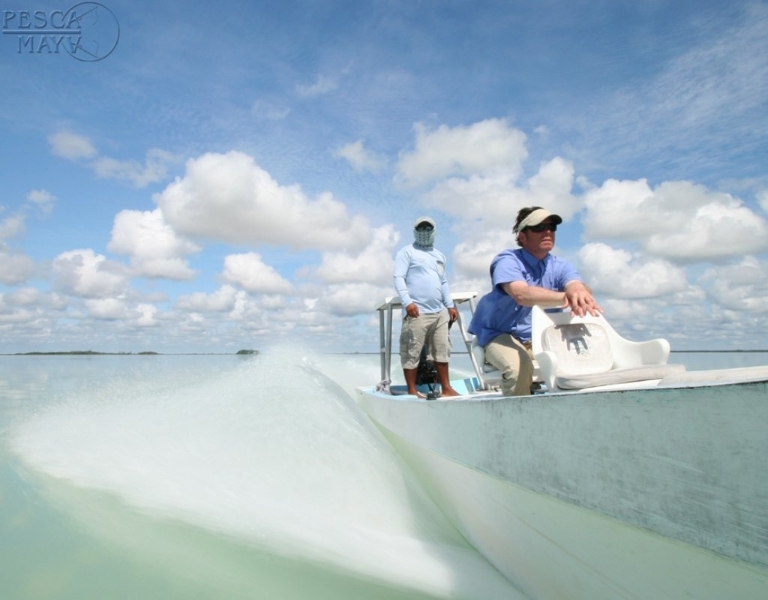 All are professional native guides, with years of experience, who know Ascension Bay and Bocapaila Lagoons as the back of their hand and will put you on the fish. 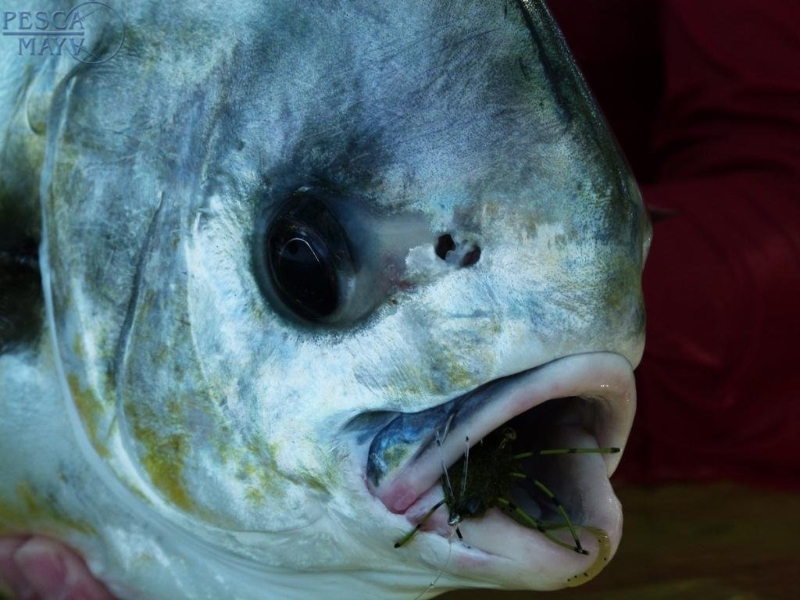 Some speak fairly good English and others speak international “fishing English”, good enough to spot the fish and direct your casting.At Pesca Maya we use a head guide and a young apprentice. Both have very good eyes. 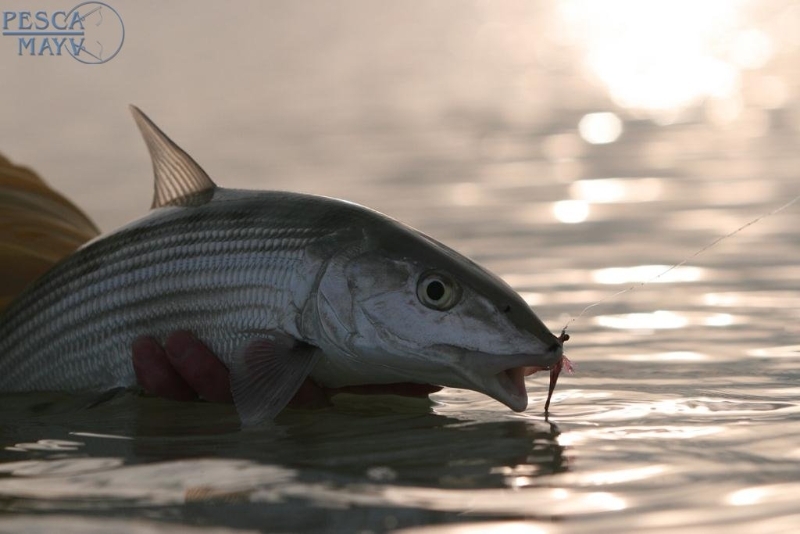 This formula helps very much when wading, each angler has a guide, when learning to cast or to see the fish, one guide poles and the other is with the angler at the casting platform, when positioning the boat and when you don’t want to wade all the way back to pick up the boat. Many of our customers appreciate it very much. I hope you will too. This program does not apply to summer time or with special discount rates. It amazes me how many people get on a boat with a guide, who they might be fishing with for a week, without any formal introduction. Take the initiative and get to know your guide. Establish a rapport. Remember his name. Let them know what you want to fish for, how you want to fish, your abilities and fishing experience as well as what really trips your trigger when it comes to fishing. Let the guide check your equipment, knots, leaders, tippet material, flies, rod and reel, etc. Don’t be shy. Before you even leave the dock, go through the following exercise with your guide. 2.) Still on the casting platform, strip out some Fly line and throw a short cast as the guide watches. Next, throw a medium cast. 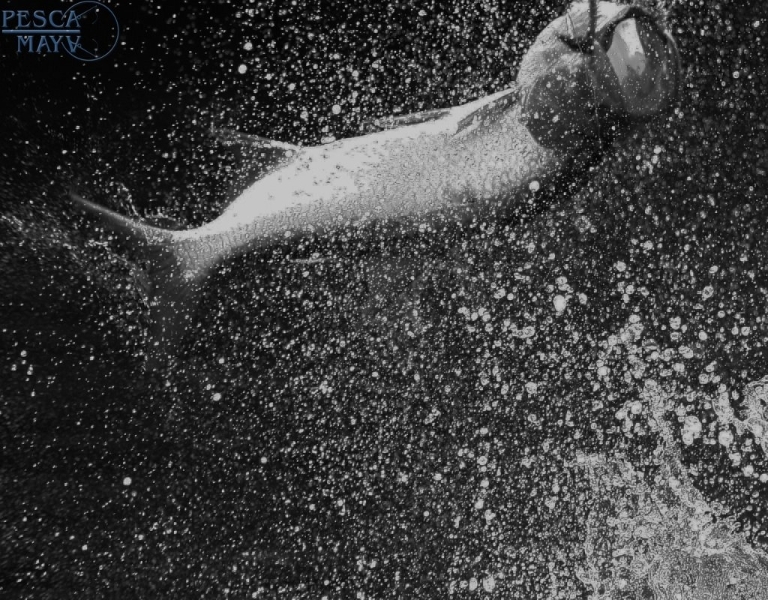 Lastly, throw a long cast. The guide now knows your casting abilities. 3.) 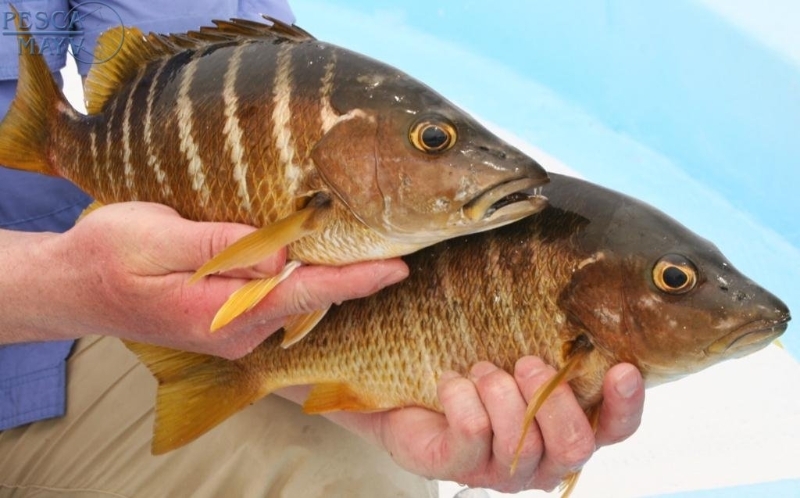 If you have a problem seeing fish, let the guide know before you start fishing. 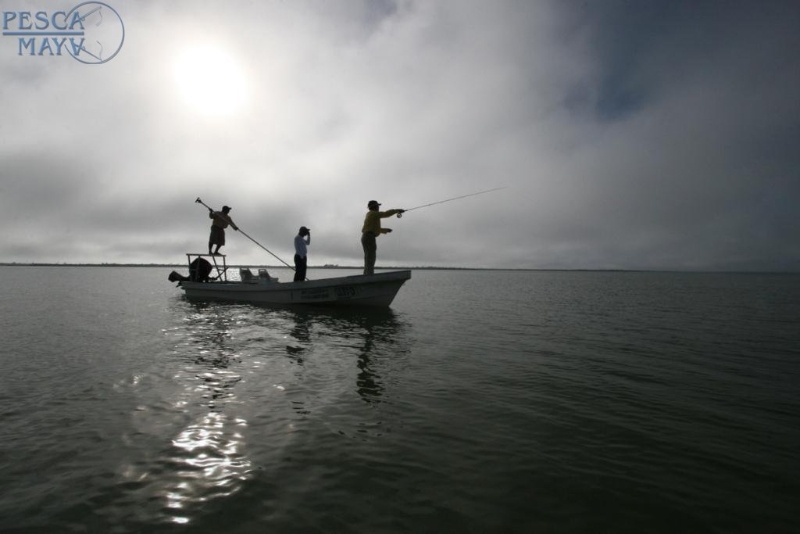 Anything that you can relay to your guide concerning your abilities, your wants and needs, your dislikes and so on will make his job much easier and your fishing day more enjoyable. 4.) 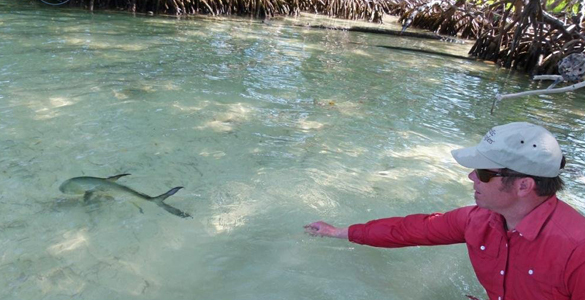 If your guide spots a fish and you do not see it, DO NOT cast until you see that fish. 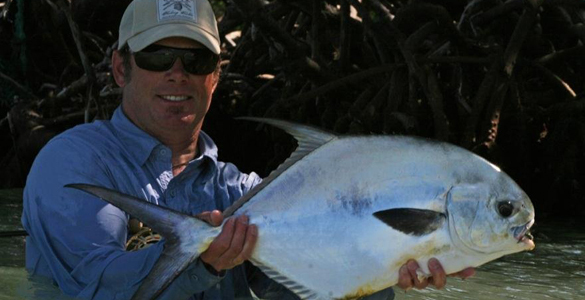 Point your rod out in front of you as if a pointer on a chalk board and have your guide direct your rod to where he sees the fish. 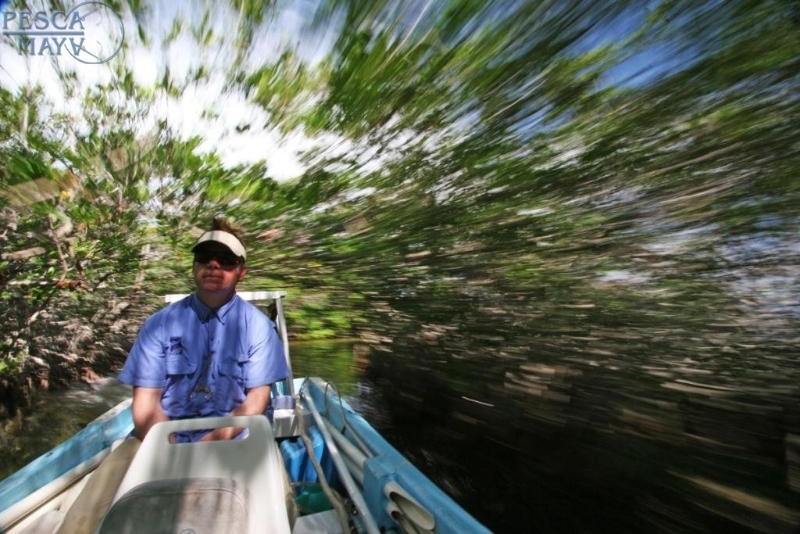 Your guide might say, “3 o-clock , more right, keep going, keep going STOP!” this is where you should concentrate your vision and again DO NOT cast until you see the fish. 5.) Follow your guides instructions. 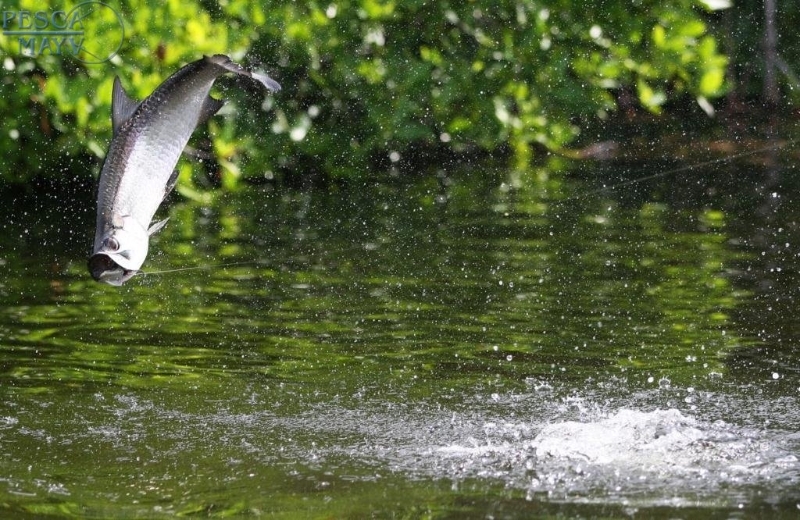 Guys, I have found that the ladies, when learning how to Fly cast or fish, are the quickest learners… Why? Because they listen to the guide. LISTEN… If he says strip, STRIP!, stop, STOP!, set the hook SET IT! You’ll see that by listening to your guide your success rate will increase substantially. “Yards vs. Meters”: Make sure that you and your guide are talking the same language. You may be thinking feet and yards and he may be thinking meters. One meter (39.37 inches) is very close to one yard. Our boats are local made, fiber glass “pangas”, with a Yamaha 40 HP outboard motor. 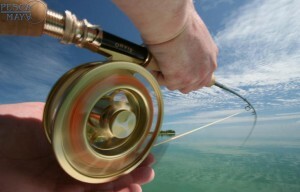 Boats are well suited for fly-fishing, With a spacious and clean platform. 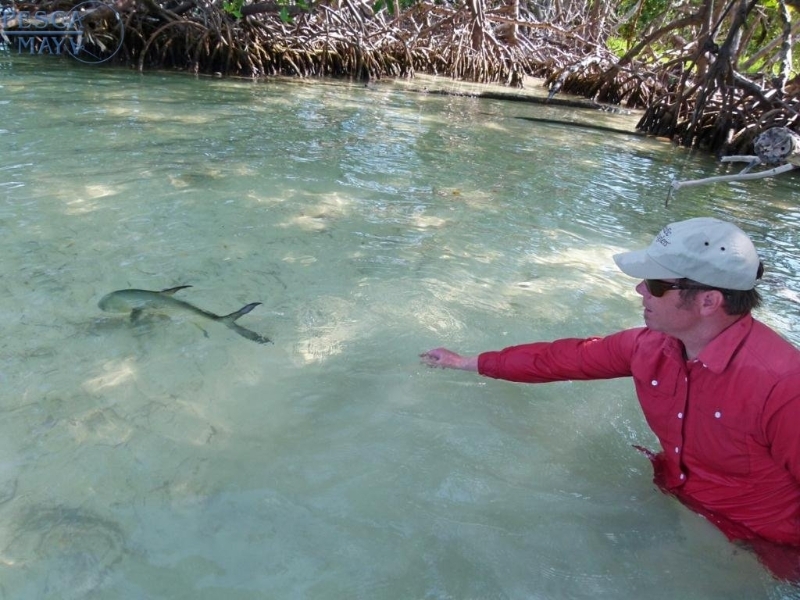 They are comfortable to cross Ascension Bay, even in the rough days and with only 6 inches in the water we can get into any flat. They do such a good job that we have even exported 4 of them to the United States. 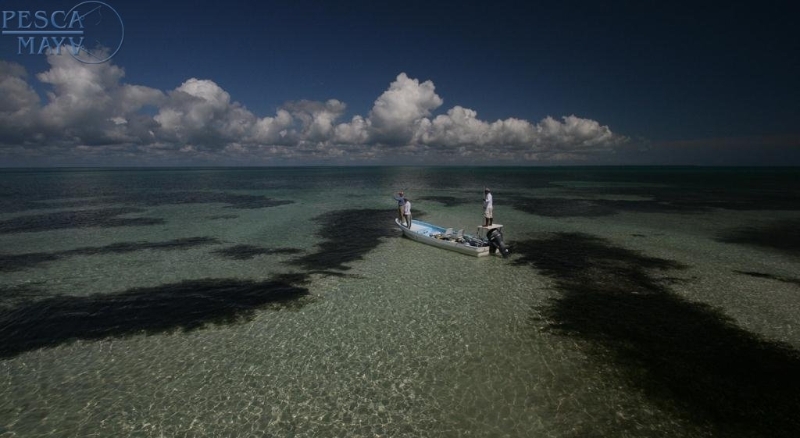 Arrive the first afternoon and start fishing the next day, then depart back to Cancun on the last morining. 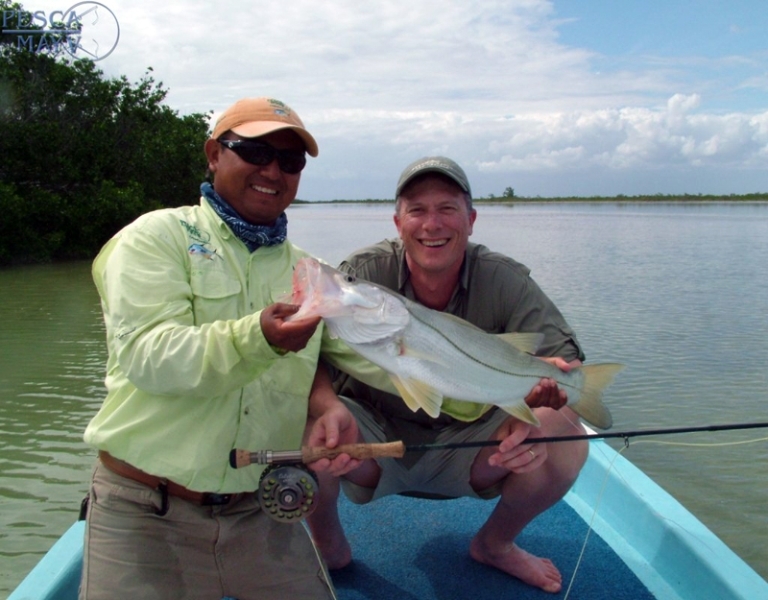 Prices Include: round trip ground transportation from Cancun to the lodge, lodging, three meals a day while at the lodge, guided fishing each day, u. 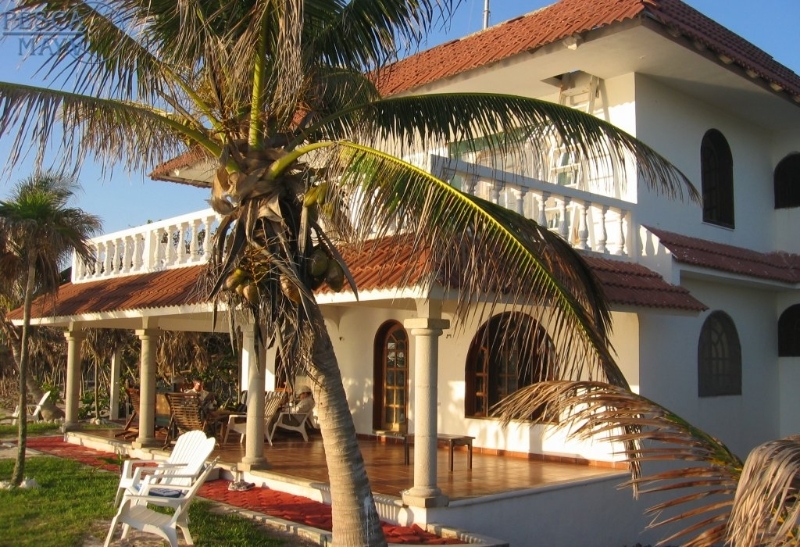 It includes soft drinks, beer and local mixed drinks ( Vodka, tequilla, rum) . It also includes all taxes. 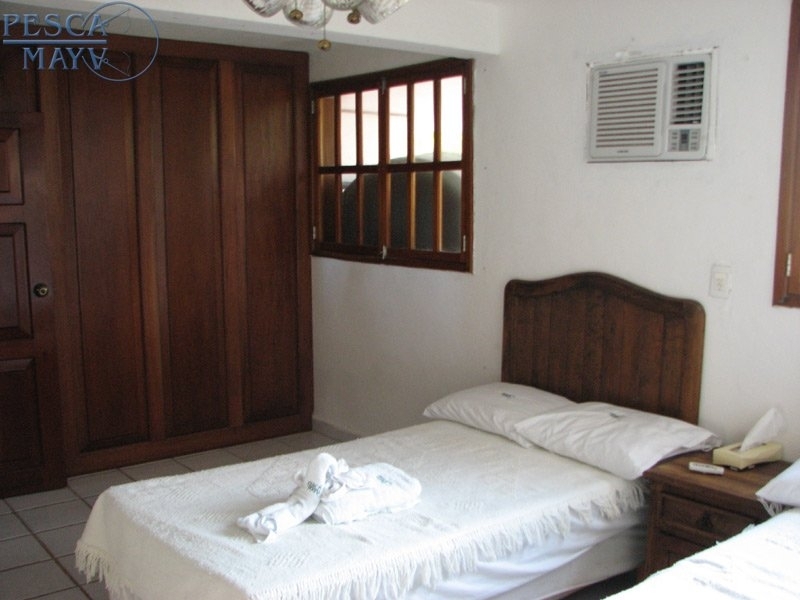 Prices quoted are per person and are in US dollars. You can choose to spend 1 less night on the lodge. 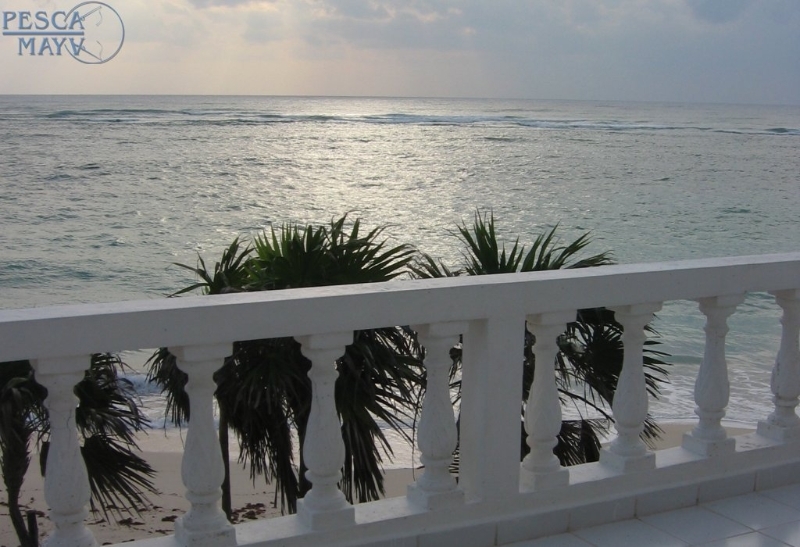 Perhaps your schedule is arrive in Cancun October 1st and depart October 7th…normally a 7 night 6 day trip. 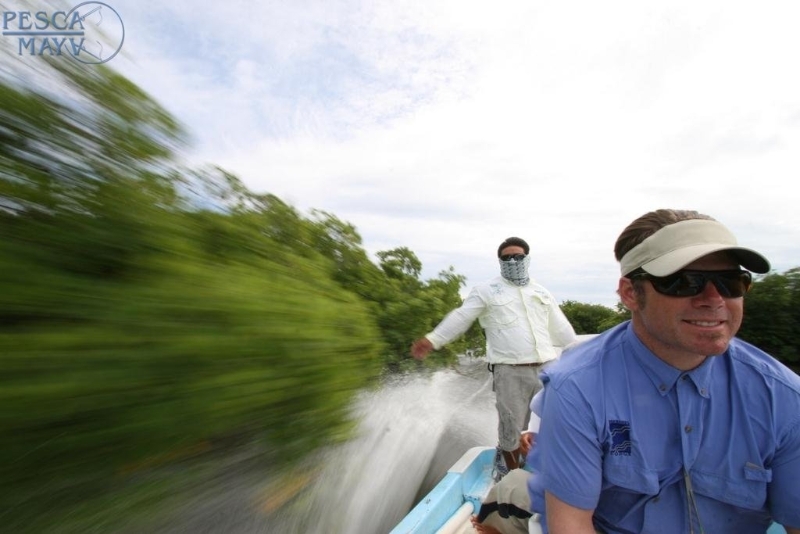 On October 1st, if you spend the night in Cancun, Pesca Maya will pick you up at the crack of dawn on October 2nd in time for breakfast at the lodge, and a full day fishing, your last day of fishing is October 6th and you overnight at the lodge and depart back to Cancun the morning of the 7th. 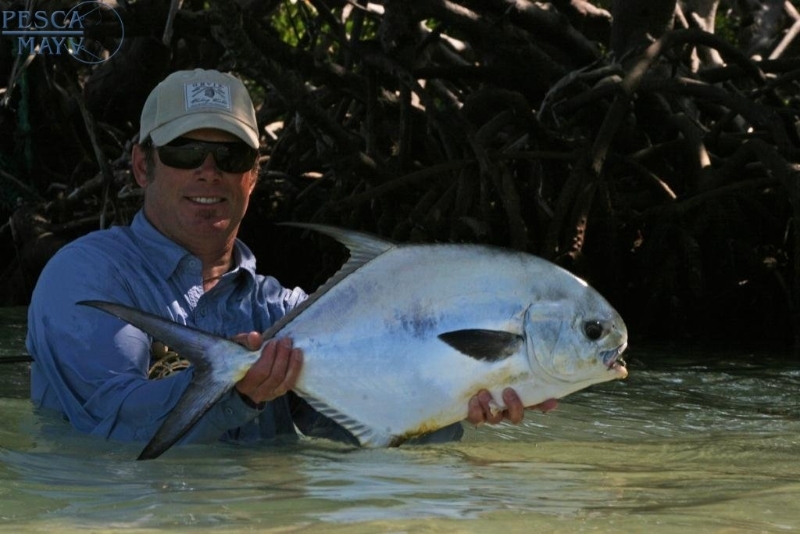 Another option to accomplish this same pricing would be to head down to the lodge the afternoon of October 1st, start fishing the next morning and then depart after fishing on October 6, staying overnight in Cancun. Either scenario would make a 6 night 6 day fishing trip. 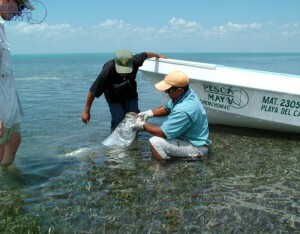 Please take a look at the photo and video galleries related to fly fishing Ascension Bay and Pesca Maya. 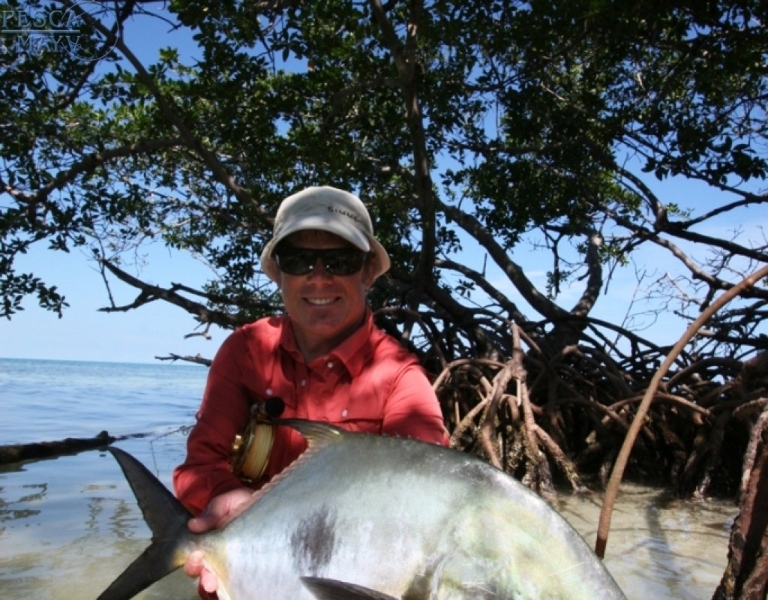 If you are not fly fishing Ascension Bay there are some other activities you may enjoy. 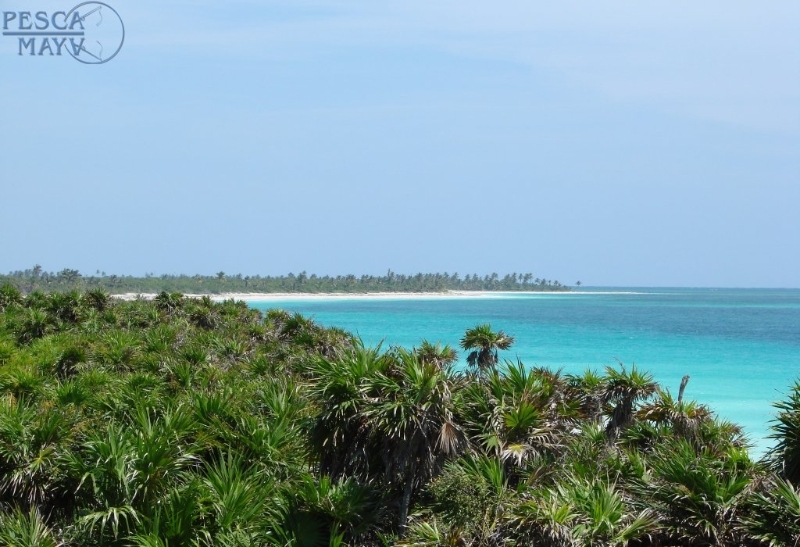 Pesca Maya is deep into the Preserve and the only 5 things to do are snorkeling, fishing, birding, beach bumming or eco touring. 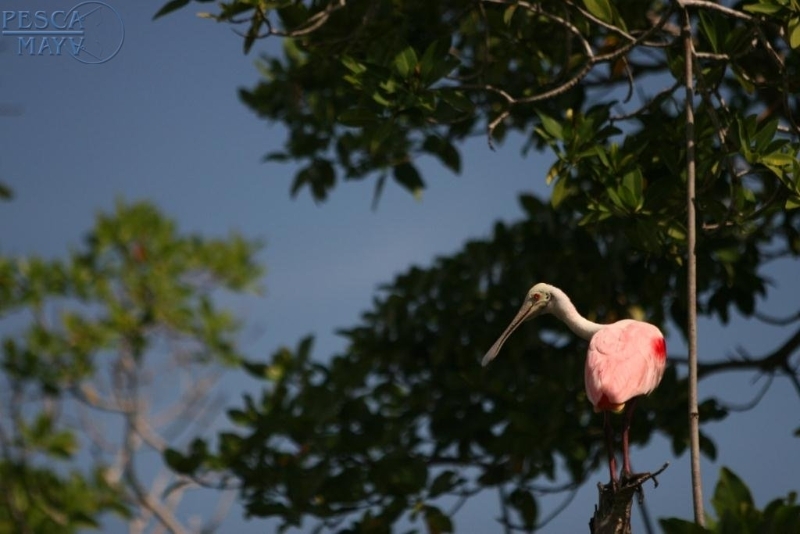 Eco touring could be flora and fauna, maybe searching for dolphins or manatees. 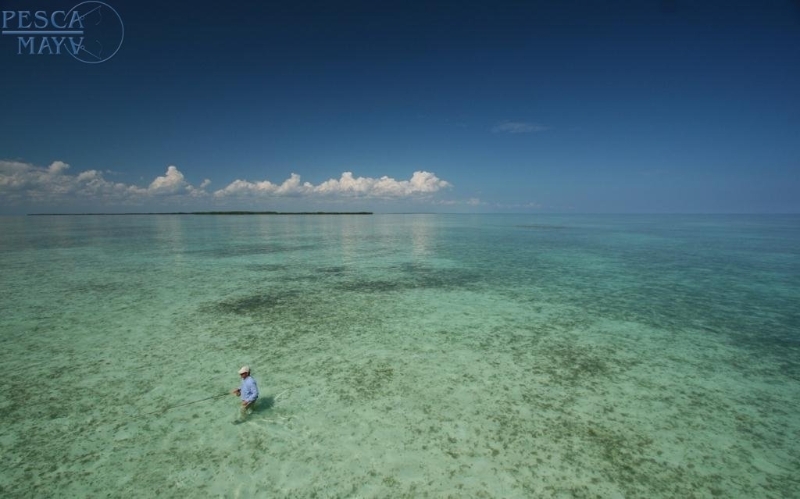 It is a remote destination, there is no pool so you should check with us before bringing a non fishing family member along with you. This trip may not be right for them. Mayan Ruins are 2-3 hours away. 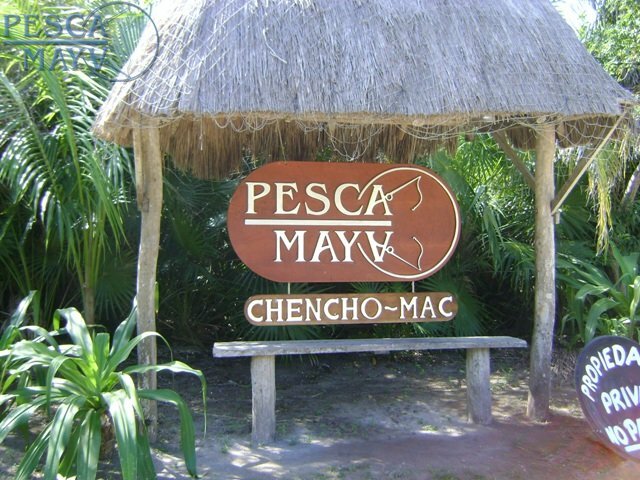 Pesca Maya is in Ascension Bay, 2-1/2 hours south of Cancun, Mexico. 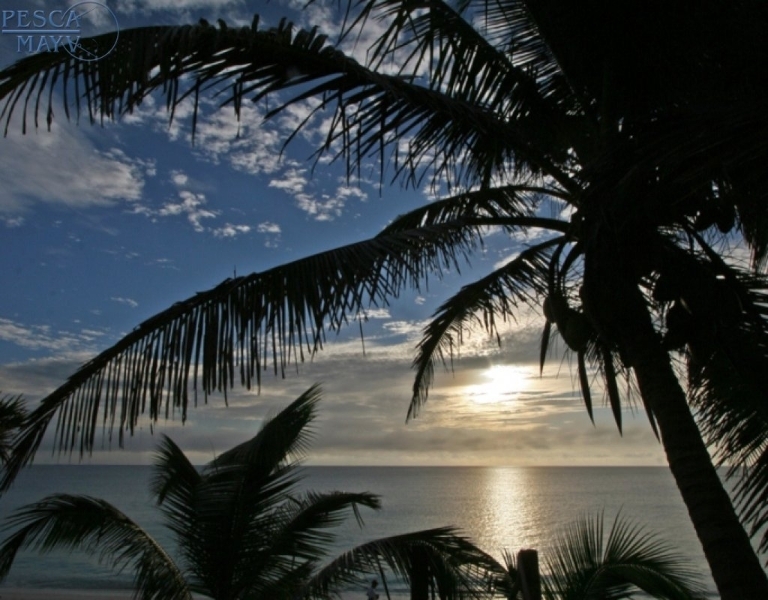 You will need to fly to Cancun, Mexico, and plan on arrival between 11:00 am and 2:00 PM Cancun time. 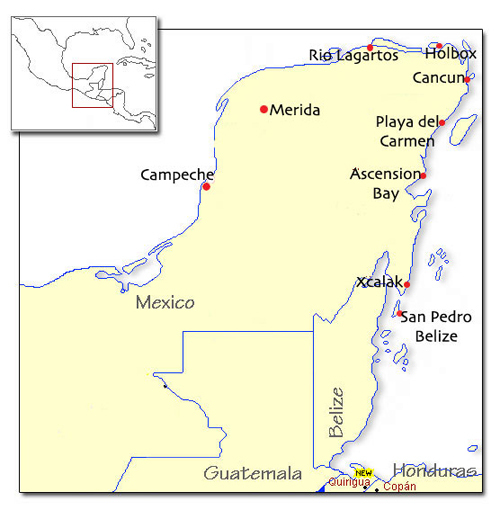 Cancun is serviced by numerous domestic carriers including American Airlines, Continental, and US Air. Direct flights are available from Miami, Dallas, Houston, Newark, Denver, LA and several other cities. Connections from most US cities permit arrivals before 2:00 PM. 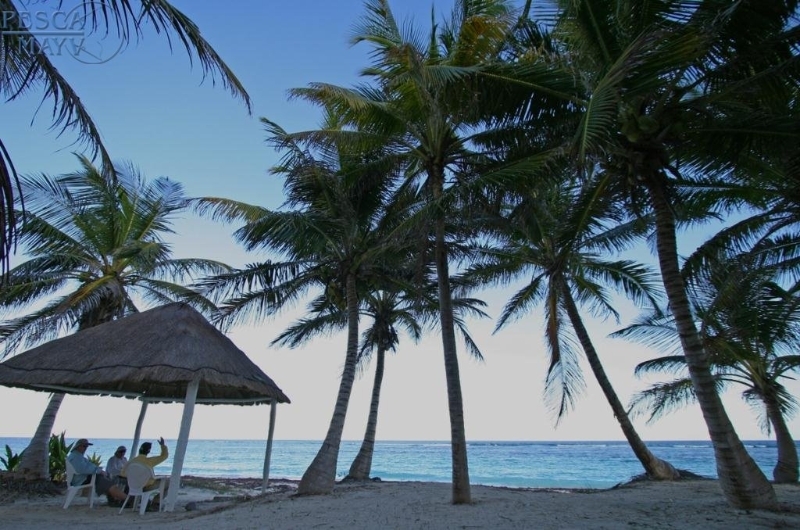 Upon arrival in Cancun, you will first clear Mexican Immigration where you will present your passport and have your Tourist Card stamped (which is provided by your international carrier) . You must then fill out Mexican Customs Declaration Form (available at counters in the terminal), which you will need to present before departing terminal. Next you will claim your luggage and clear Mexican Customs. As you leave customs proceed to the arrival lobby. As you exit customs area to the arrival lobby, a Pesca Maya representative will meet you, who will provide the transfer to the Lodge. The drive to the Lodge will take about 3 to 3 ½ hours. 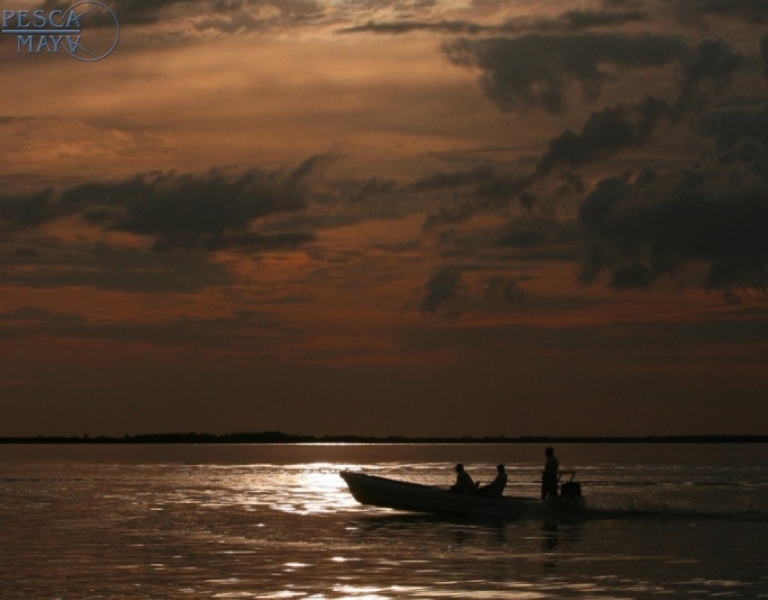 Due to the duration of the transfer, Pesca Maya schedules one transfer per day, usually departing Cancun around 1:30 PM. If you arrive early (11:00 am for example), you may have to wait for other guests to arrive before leaving the airport. 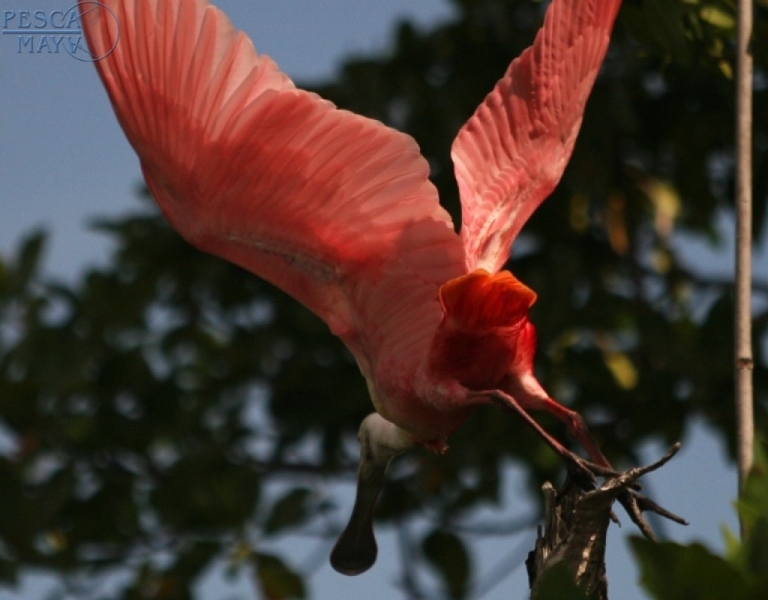 If there are other arrivals later that day you will depart Cancun immediately. 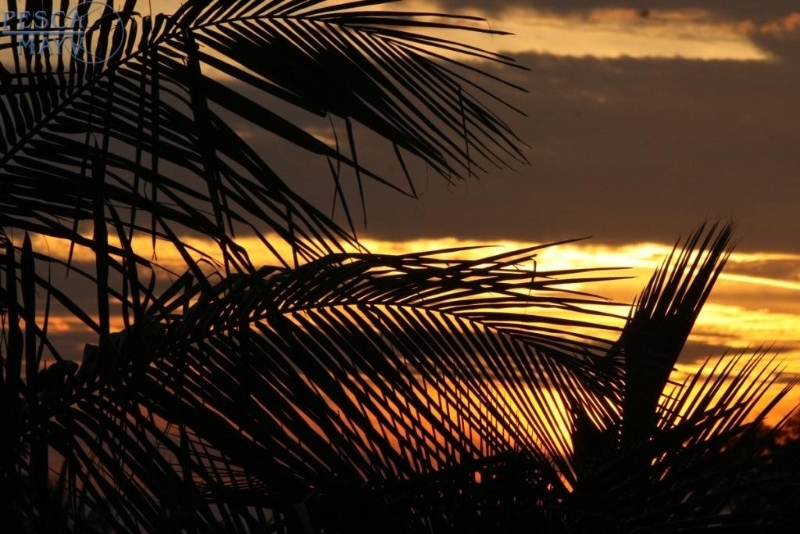 However guests arriving to Cancun after 3:00 PM, may be charged a special transfer surcharge. If the normally scheduled Pesca Maya transfer has already departed for the Lodge. 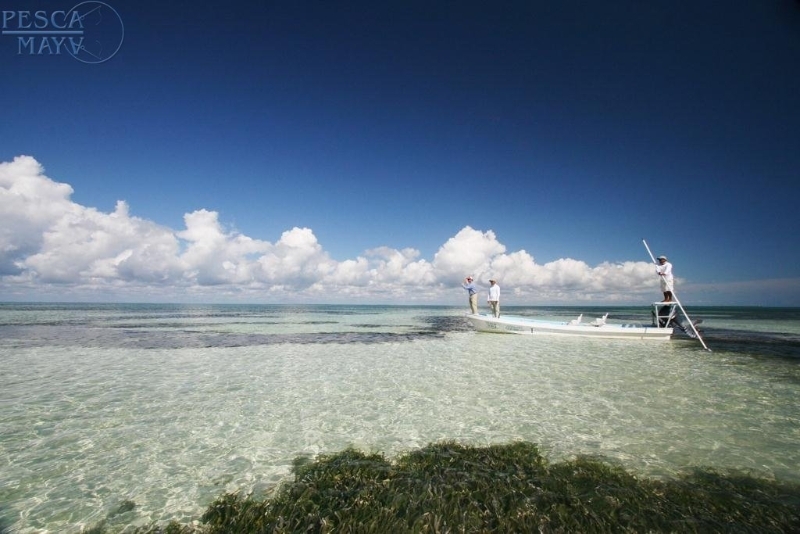 If there are no other arrivals on your arrival day, Pesca Maya will schedule the transfer to your arrival time. The current special transfer surcharge is US$200.00 per vehicle trip, divided by the number of late arriving guests. If you arrive in Cancun very late or your flight will leave very early on your departure date, we can assist you to find accomodations to overnight in Cancun. Upon confirmation of your booking we will send you our complete PRE TRAVEL INFORMATION PACKAGE including recommendations on gear to bring.